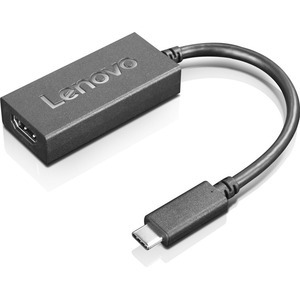 The Lenovo USB-C to HDMI 2.0b Adapter connects USB-C enabled notebooks to HDMI enabled displays such as monitors and projectors. Its 240mm (9.4") length and 34g (0.07lbs) weight make it versatile and travel ready. So you can enjoy all the benefits of HDMI 2.0b technology, like support for resolutions up to UHD 4K @60Hz, at any time.